Students start doing their assignment without understanding it properly and that is one of the most common mistakes where students lose marks. Once you have understood the topic then you can write an assignment with ease, as it is really difficult to write an assignment. For example: if you don’t understand the topic and you’re still continuing to write your assignment then you’ll just submit a detailed assignment that has no relevance to the topic and is inaccurate. So, all your efforts will go in vain just because you did not understand the topic and the details to write your assignment. You should clear out your doubts with the help of your teacher or professor, instead of making a fool out of yourself. Here are some questions that you can ask your teacher before submitting your assignment so that it is perfect. Firstly, you need to know the purpose of the topic assigned to you to write an A-grade assignment. You can take your teachers help if you don’t understand the topic. Suppose you have to write a social science assignment on the topic political views, so you must go to your teacher and ask if you have to write with respect to jus your country or the whole world. There are different formats for different kinds of assignments. The format of an essay and dissertation and thesis are different from one another. But essays are also of different types so even different types of essays have different formats. All this gets very confusing so you must ask your guide or teacher who is in-charge of your assignment about the format that you have to follow for your assignment. Even if your assignment is informative but the format is wrong then you can lose some marks. Plagiarism report is important with every assignment but sometimes you may have to submit a reference list as well with all the sources you used for help while writing your assignment. Reference lists are of various types and all have different formats. Having a correct format is essential as there are extra marks for correct format. The different types of reference lists are – MLA way, Chicago way and Harvard way so you need to ask your guide which one you have to follow. When you start writing your paper, the length of the assignment is the most important. There is always an assigned word limit to your assignment so writing less or more than your word limit can make you lose marks. Therefore, it is very important to know your word limit and this way you can plan and start writing. It will help you in knowing how much to write in each paragraph. However, there is a certain amount of limit that can cross so you should confirm that also with your teacher. You can even leave out the irrelevant details if you think you’ll exceed the word limit. The marking scheme that the teachers follow while grading your paper is different for each assignment. For example, the basis for marking in an essay is the body part. Similarly, in thesis and research paper, the important part for marking is the outline and the abstract summary. The marking pattern varies for different subjects as well. Like, detailing is required in science and quality and creativity is required in literature. So, if you want extra marks you should ask your teacher to give you an idea of the marking scheme. Students usually use Wikipedia to gather information as evidence on their assigned topic while writing their assignment. Wikipedia is considered to be one of the most unreliable sources by teachers as it can be edited by anyone. Teachers usually fail the papers that they think the student has written using the wrong sources. The only data that the teachers think can be used as information for students to write their assignment can be collected from external sources like government websites, newspapers, journals, magazines and scientific studies or internal sources such as lectures and in-class texts. You can collect data from library books and textbooks and lecture notes. This will help you write a well researched assignment and can also fetch more marks for you. It is very important for you to know the audience for your paper before you start writing it. Generally, assignments are written for the teacher who gave you the assignment but sometimes there may be a wider audience. Like for example, a research paper that you have written will be read by a few researchers and your juniors. Knowing you audience will help you in understanding the tone in which you have to write the paper. For teachers and professors, you will use a formal tone and if the audience for your paper is wider then you should write it in formal as well as informal so that your audience can relate with you. Submission of associating reports is one of the most common questions that students ask as plagiarism is a very serious issue nowadays. Teachers need proof that you haven’t copied your assignment from somewhere else. So to make sure your assignment is a genuine, your teacher might ask you to submit a plagiarism report along with your paper. Turnitin and Grammarly are two of the many sources through which you can generate a plagiarism report and teachers usually ask students to use these tools as they are accurate. Are you allowed to take external help? 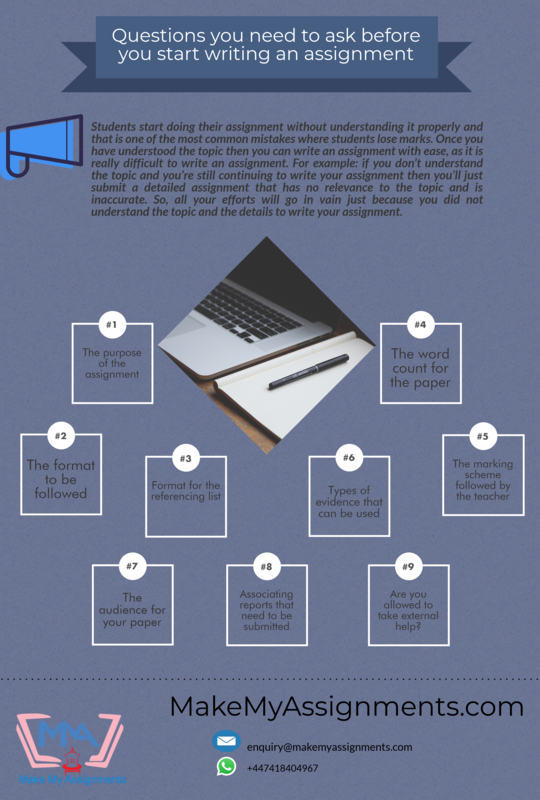 Assignment writing can be very difficult for you if you are not too fond of writing. And even if you do like to write, you might run out of patience that is necessary to write a perfect assignment. But you can take help from someone and make your task easier. You can take help from your teacher or mentors or your seniors or a professional assignment writing help organization. But you can do that only if you’re allowed to take help from external sources. Before you take help from others, it would be best if you ask your teacher first if you can do so. You can always ask your teacher who gave you the assignment if you have any doubts or questions regarding the paper. Only your teacher can give you perfect solutions for your questions. Your can teacher might also get impressed if you go up to them with queries as they’ll think you are serious about the assignment. 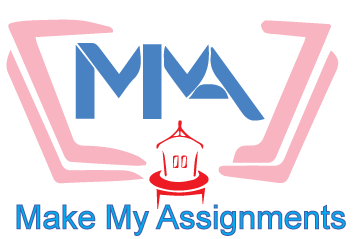 If you are not able to write such lengthy assignments and want help you can try MakeMyAssignments.com. We have a team of experienced professionals that can help you in writing a perfect assignment. We are the best in online assignment help service as per our customers. We offer quality service and on time delivery for students who have a deadline for submission.